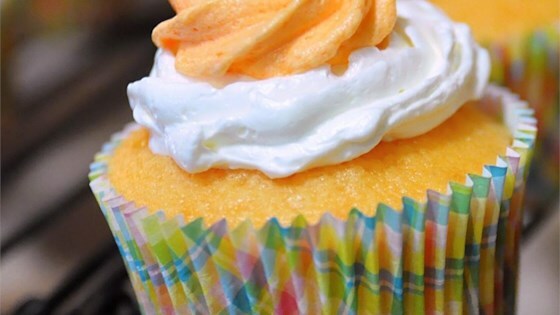 "These cupcakes blend two of my favorite flavors: orange and vanilla! Reminiscent of a childhood ice cream pop treat, these cupcakes will make you feel like a kid again!" Beat together the orange cake mix, creamy salad dressing, whipped topping mix, 3/4 cup orange juice, eggs, and 2 tablespoons orange zest in a large bowl with an electric mixer on low speed until mixture is moist, about 1 minute. Scrape down the sides of the bowl with a spatula, then increase speed to medium and continue beating until well blended, about 2 minutes more. Fill the prepared cupcake cups about 2/3 full of batter. Bake in the preheated oven until a toothpick inserted into the center of a cupcake comes out clean, about 15 minutes. Cool in the pans for 10 minutes before removing to cool completely on a wire rack before frosting. To make cream topping: Beat the marshmallow creme, 1/2 cup unsalted butter, and 1/2 cup shortening in a bowl with an electric mixer until smooth and creamy. Top each cooled cupcake with a 1/2-inch thick layer of the cream topping, using a knife to spread the the topping flat. Allow about 1/2 inch of the orange cupcake to show below the white layer. To make orange butter cream: Beat 1/2 cup unsalted butter and 1/2 cup shortening together in a bowl until light and fluffy. Mix in 1/4 cup orange juice, zest of 1 orange, vanilla extract, and food coloring until well combined. Gradually beat in the confectioners' sugar until smooth. Transfer the frosting to a piping bag fitted with a large star tip, and pipe a decorative layer of orange butter cream, ending in a peak, over the cream topping on the cupcakes. You could add a little vanilla extract (1/4 teaspoon) to the cream topping to up the vanilla taste. These were fantastic! Also used the vanilla cakemix and added 2tsps of orange extract...I should have added 1tsp more, I think...next time for sure! These are amazing!! I wasn't able to get orange cake mix, so I used french vanilla with orange extract. Wonderful!